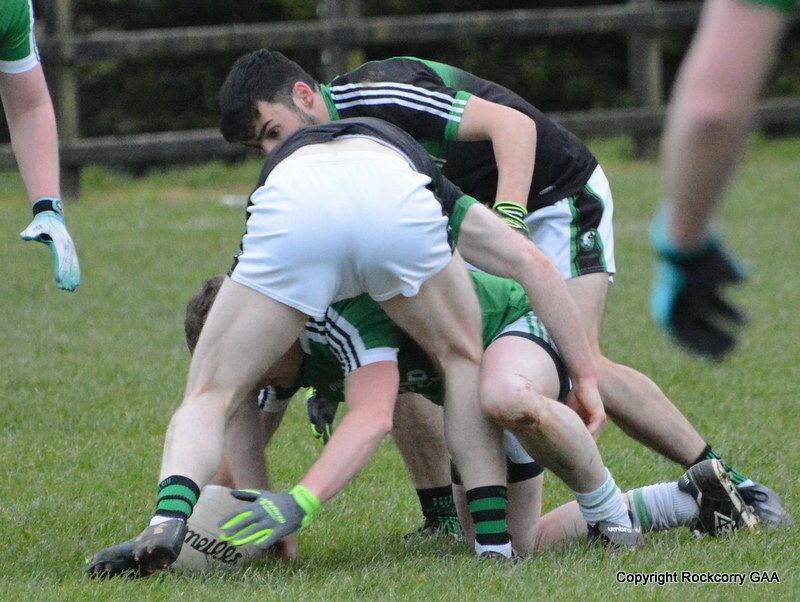 A good start is half the battle, so they say, but this was certainly not the case when our senior team travelled to O’Neill Park on Wednesday 21st August to take on Doohamlet in the Drumlin Credit Union senior football league because Doohamlet totally controlled the openings minutes and turned their superiority into scores when it mattered and from an early stage it was quite clear there was only going to be one winner! Despite the very dark clouds overhead the threatened rain stayed away for the hour’s action and Doohamlet started in a whirlwind fashion and showed more desire and hunger during the opening exchanges and demonstrated their intent early on with two early points on the 1st and 2nd minutes. They continued to dominant the battle for primary possession and brought a greater intensity level to the opening moments as our lads were off the pace and Doohamlet quickly added a further goal and a point open up a six point advantage, leading 1-3 to 0-0 after only seven minutes. 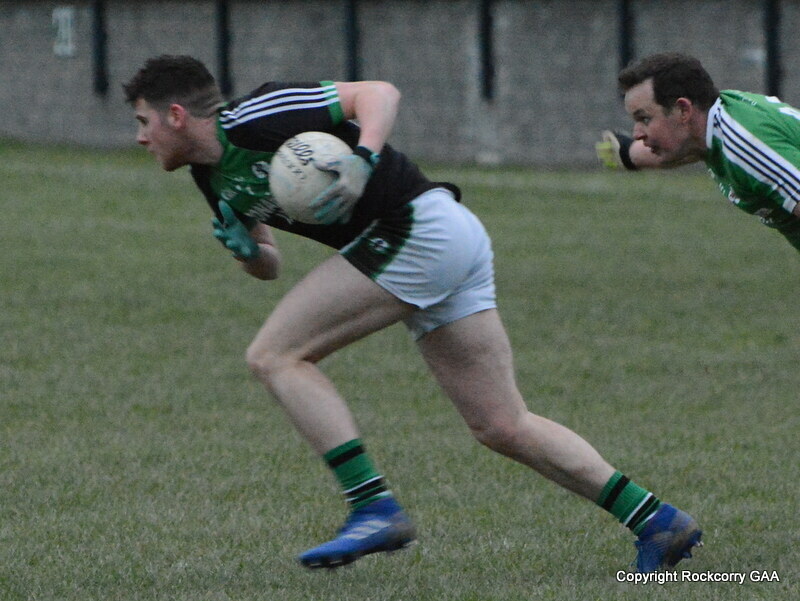 We opened our account a minute later when Mark Daly, showed glimpses of why he was named Monaghan intermediate player of the year 2012, as he surged forward bursting through the Doohamlet defence, bouncing off a few heavy tackles, but he was able to create enough space and finished in style with a superb point. This was followed up moments later when centre-half back Noel Carroll glided up the field and hit a classy point following a good build-up that also included Paul McKeown and Mark McGuirk. 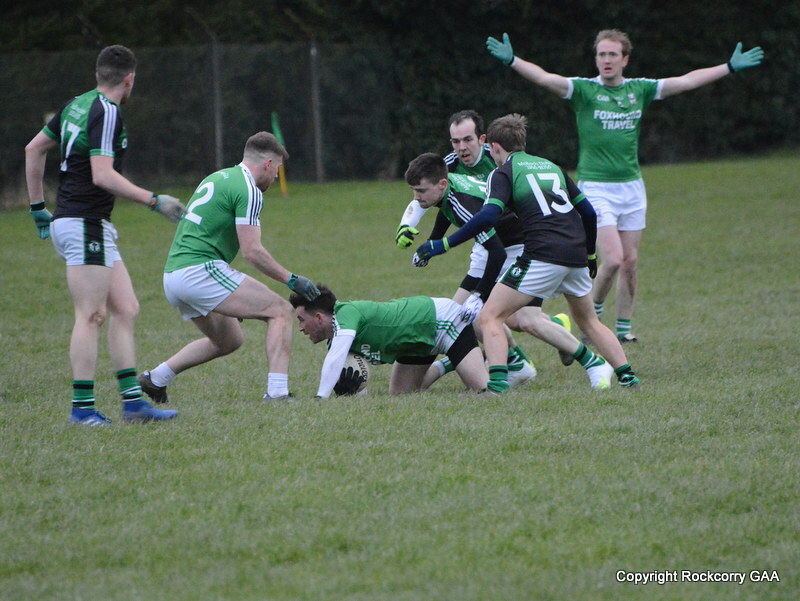 However, any notion of a comeback was short-lived as Doohamlet kicked two additional points on the 12th and 13th minutes to leave the scoreboard showing Doohamlet 1-5 Rockcorry 0-2. Anthony Tate pointed neatly, on the 14th minute, after clever work by Stephen Lynch and Dwayne Rooney but Doohamlet maintained their upper hand and unfortunately it was all too easy for them as they sauntered through our rear-guard virtually unchallenged and notched over a fine point on the 15th minute. Two minutes later, with massive gaps appearing, the killer blow arrived when they hit the back of the net for the second time and they quickly added another point from a routine free-kick to open up a commanding nine point lead, leading 2-6 to 0-3. We instantly replied with a flowing move of our own that involved Noel Carroll, Stephen Lynch, and Dwayne Rooney who teed-up Lorcan Smyth who brought out a fine save from the Doohamlet goal-keeper and thankfully Mark McGuirk reacted the quickest and from close range guided the loose ball with aplomb, past the advancing Doohamlet goal-keeper, to hit the back of the net for a crucial goal. Dwayne Rooney kicked wide on the 23rd minute but a couple of minutes later Lorcan Smyth converted a difficult free-kick following a foul on Mark McGuirk to put a ‘bit more’ respectability on the score-line! With half time approaching Doohamlet showed no mercy and scored two quick-fire points to take a commanding 2-9 to 1-4 advantage going in at the interval. With eight points behind we had the proverbial mountain to climb and if we were going to get back into the game we needed a good start. 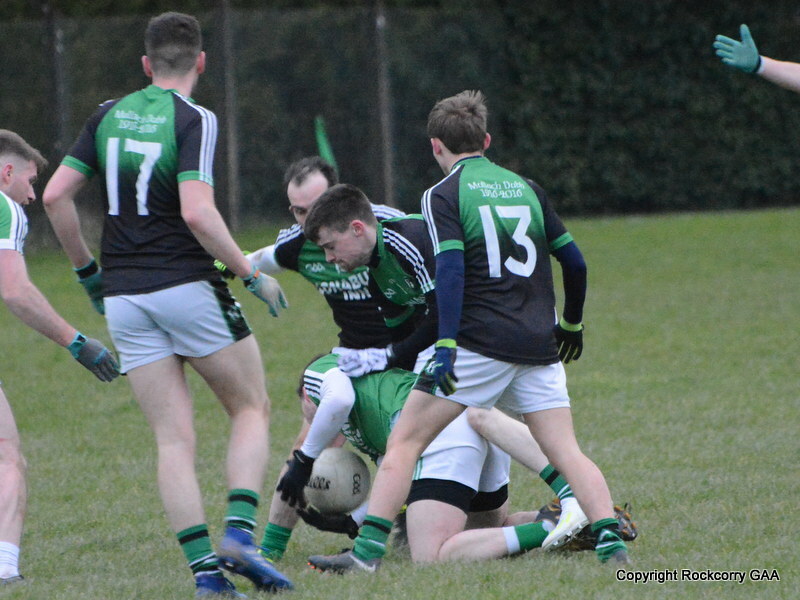 In fairness, credit is due to the lads who put in a battling performance and never threw in the towel and definitely played their best football of the evening during the third quarter when they scored five points without reply. The fight back started on the 2nd minute when Paul McKeown got us off the mark with an excellent score and that was quickly followed up by another neat point from Colin Quinn. Our midfield pairing of Martin Carroll and Mark Daly started to settle into the task and took control of that sector, winning a string of kick-outs and loose balls and when Mark Daly won possession on the 5th minute he delivered a lovely pass into Paul McKeown who hit another sweet point. The hunger, determination and resolve, that we all witnessed the team display back on the fabulous day in October 2012, was now very much evident and one wondered where was this performance during the first half? Dwayne Rooney continued the good work with a fabulous point on the 7th minute and when Damien Matthews intercepted and broke down a promising Doohamlet attack he instigated a swift move that involved a number of players including Colin Quinn, Keelan Clerkin and Noel Carroll who found Dwayne Rooney prowling in space and he kicked a point that had top drawer quality written all over it to reduce the arrears to three points, Doohamlet 2-9 Rockcorry 1-9. However, that was as good as it got because, sadly we were not able to maintain our momentum as the scoring dried up and our five consecutive scores was broken as Doohamlet once again hit form and tagged on four unanswered scores on the 15th, 18th, 19th and 28th minutes to regain a seven point lead, 2-13 to 1-9. The lads continued to fight on and mustered up a couple of half-hearted goal chances in the closing moments but scores were hard to come by with a resolute Doohamlet defence and we never really tested the goal-keeper and as the game entered the final minute of normal regulation time Lorcan Smyth lobbed a high lopping ball into the Doohamlet goal-mouth that broke perfectly for Noel Carroll who finished with an outstanding unstoppable shot that rattled the onion bag but regrettably it was all too little too late as the referee sounded the final whistle and Doohamlet sealed the win on a score-line Doohamlet 2-13 Rockcorry 2-9. 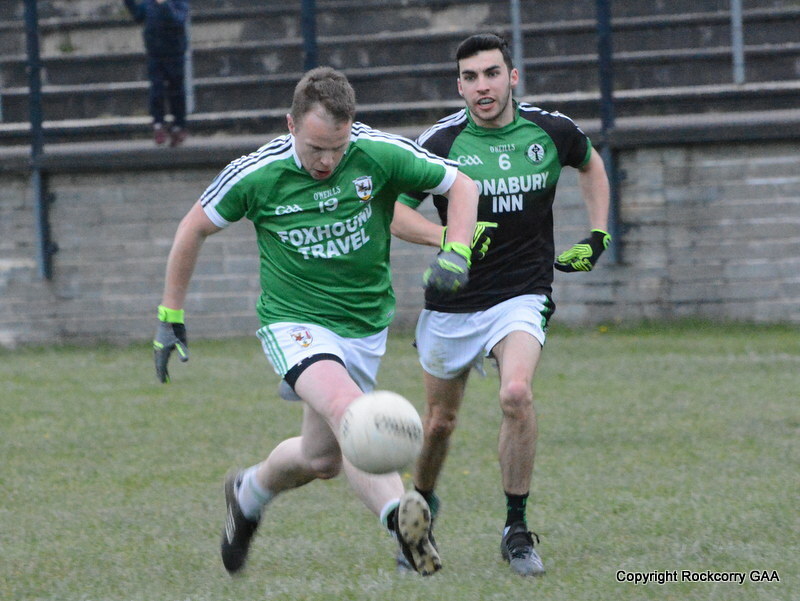 Team & Scorers: Jamie Smith, Damien Matthews, Niall McKeown, Keelan Clerkin, Colin Quinn 0-1, Noel Carroll 1-1, Stephen Lynch, Mark Daly 0-1, Martin Carroll, Conor McGeough, Cathal Sheridan, Paul McKeown 0-2, Dwayne Rooney 0-2, Anthony Tate 0-1 & Mark McGuirk 1-0. Subs used: Lorcan Smyth 0-1f for Conor McGeough, Conor McGeough for Cathal Sheridan.